Family-owned for Over 10 Years! 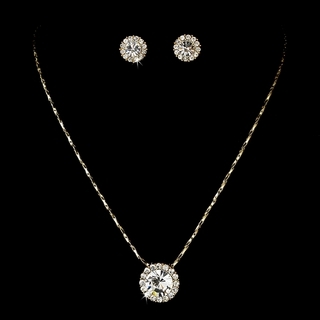 Simple, yet stunning, this gold-plated necklace and earrings set features a symphony of sparkling clear rhinestones. This set makes a lovely gift for bridesmaids, or the perfect accessory to a prom or homecoming gown! Size: The necklace measures 14-1/2" long with a 3" extender and a lobster-claw clasp. Matching earrings measure 1/2" in diameter. home | about us | contact us (e-mail) | ordering info | VIEW CARTCopyright � 2018 A Touch of Class Creations. All Rights Reserved.